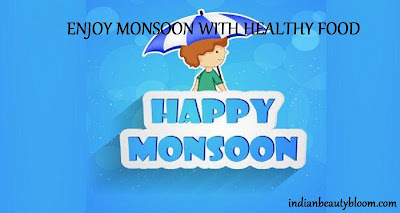 Monsoon being much awaited season after summer comes with lots of things like Blooming flowers , Mitti ki khusbu , Tip-tap raindrops , Dip in temperature ( much relief from scorching summer heat). All these being pleasant ones and people do enjoy rainy season and its delicacies . But there are some unpleasant and unwanted things too like virus , bacteria , germs , mosquitoes and health problems related to these. So one need to be careful and should take proper measures to protect oneself from all these . 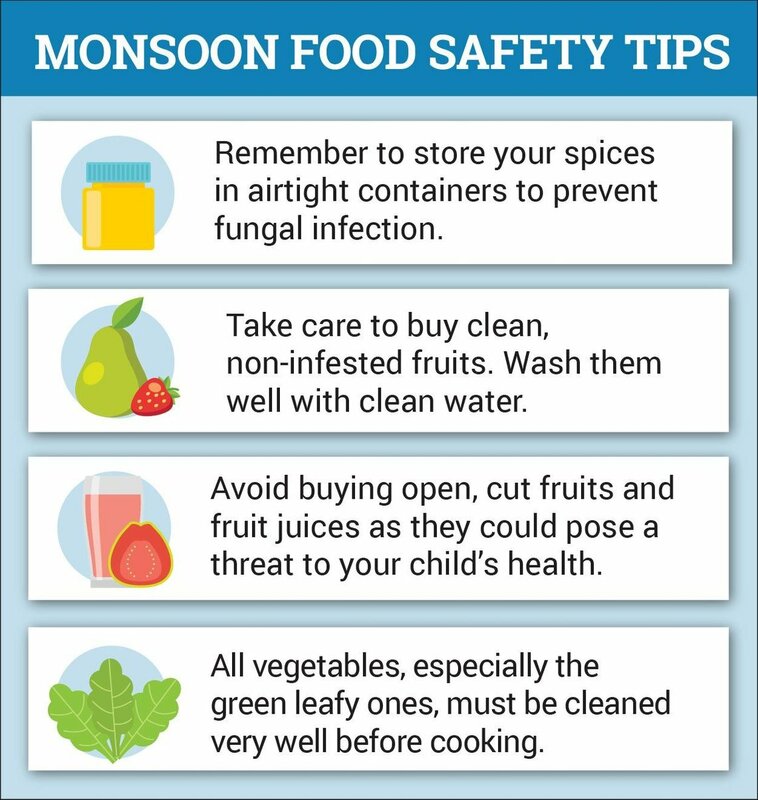 Taking healthy food & drinks during monsoon is too important to stay healthy and develop immunity. * Lower down salt intake as it causes water retention and more health problems during monsoon . * Avoid fruits like watermelon as it can cause bloating . * Avoid spicy food as it can raise body temperature and can cause allergy . * Use of bitter gourd and turmeric can help in preventing infections . * Prefer boiled and purified water so to avoid water borne diseases . * Avoid street food , they are too tempting but better to avoid street food because of hygiene reasons and prepare healthy snacks at home. The grime and dampness present in it makes them susceptible to germs. It reduces minerals in our body which in turns leads to reduction in enzyme activity. The highly humid monsoon weather causes digestion process to slow down , so better take chicken soup than fried chicken . Liked by all , its delicious and healthy . 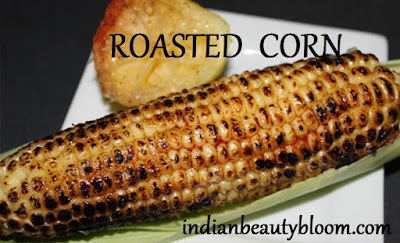 It’s a rich source of Fiber , Vitamin C , Folate , Proteins & carbohydrate . Vitamin C in it acts as antioxidant and improves immunity . It also helps to feel fuller for longer thus helps to maintain weight. 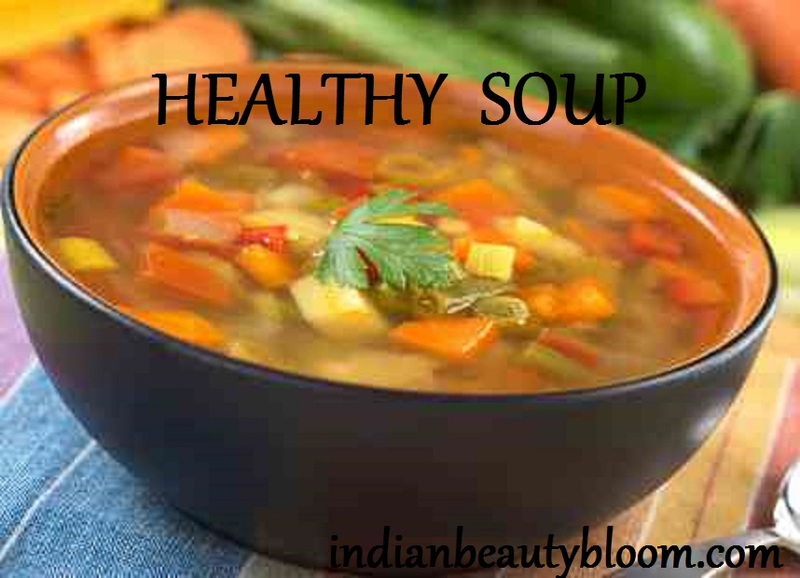 Soups are healthy as low in calorie and rich in fiber . 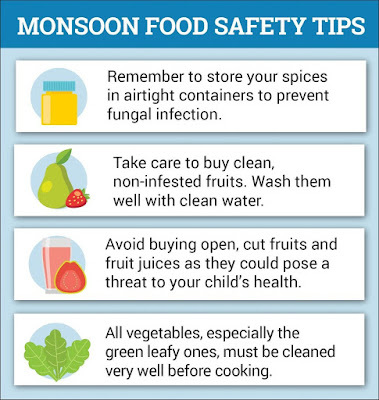 One can prepare vegetable soups or even chicken soup in monsoon. Hot soups are relishing and delicious and liked by people of all age group . Easy to digest and gives instant energy and some relief from cold . 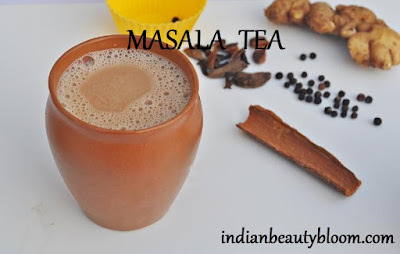 Instead of simple milk tea one can prepare masala tea in monsoon & winters . Adding a little of ginger , cardamom not only enhances flavor but also increases medicinal value . Prevents cold & cough problems. 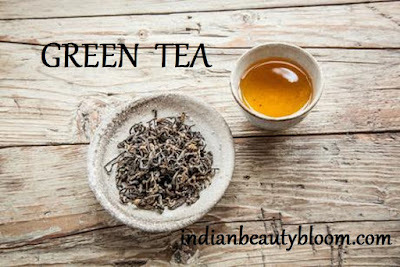 Green tea has numerous health benefits . They are rich in antioxidants , helps to control weight . Helps to flush out toxins from the body . One can enjoy green tea in monsoon to stay healthy & active. Past few years I am drinking lots of green tea because of its health benefits . It has some wonderful flavors of tea . I have tried few and liked them , good to taste & are refreshing . Flavors like Peach Tea , Lemon Honey are too good . They have some flavors in Wellness Infusion Tea . The one flavor which I want to try is Cardamom Turmeric Tea . It’s a blend of Golden Turmeric , Cardamom & Fruity Orange peel . 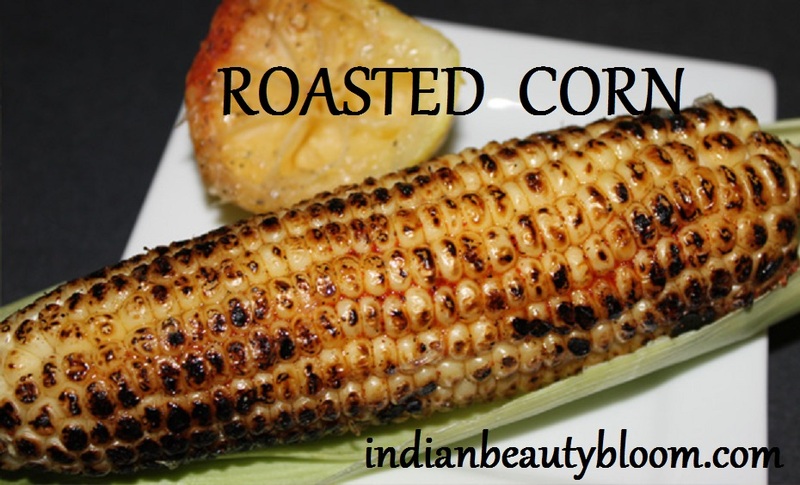 It’s rich in antioxidants and helps to flush out toxins from the body and improves immunity. We all know health benefits of cardamom and turmeric , when blended in a green tea is too good . Since it’s packed in a Tea Bag , very easy to prepare , one can add honey or sugar as per taste or can simply have it without any sweetner. These packs are Travel Friendly too . One can easily carry these tea bags in purse or bag and can enjoy it anywhere . One can buy these Tea from online stores like Amazon . 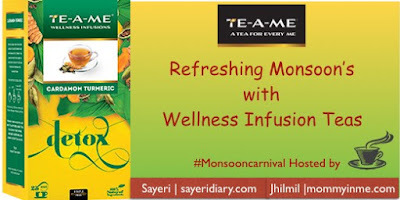 Would like to Thank our prime sponsor TE-A-ME and hosts for hosting this Monsoon Carnival .